SIGNUM for Media provides a comprehensive solution for television networks looking to bring on more advertising partners with repeatable successes. 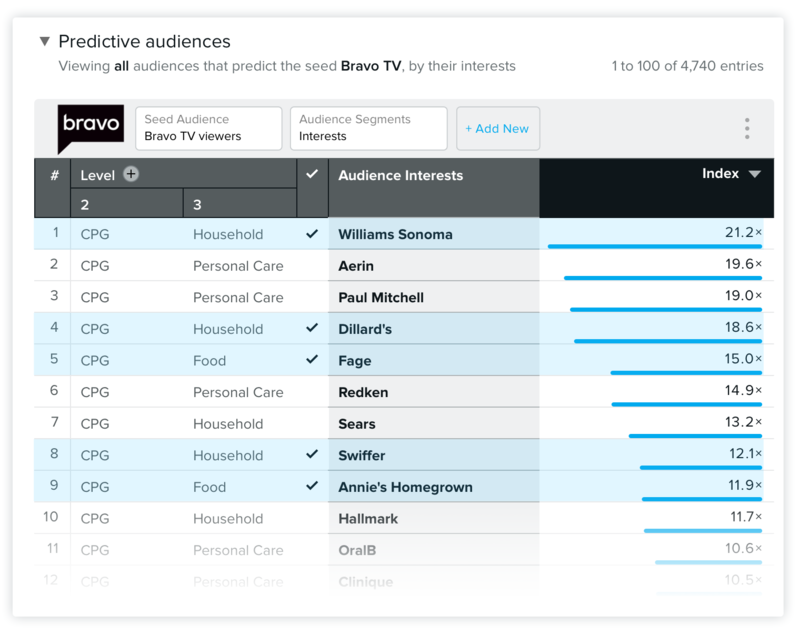 As an example, Bravo TV could use SIGNUM Reach to discover that its viewers are 21.2x more likely than the average person to spend money at Williams Sonoma. This information could clearly prove very valuable for the Bravo ad sales team when pitching a potential advertising partner like Williams Sonoma. With the ability to index audience affinity against other networks, Reach allows us to see how differentiated retailers like Williams Sonoma are for Bravo relative to one of its direct competitors, A&E. Here the data shows that Bravo watchers are 70% more likely than A&E watchers to spend money at Williams Sonoma. This looks like a great place for Bravo to allocate resources for pitching. 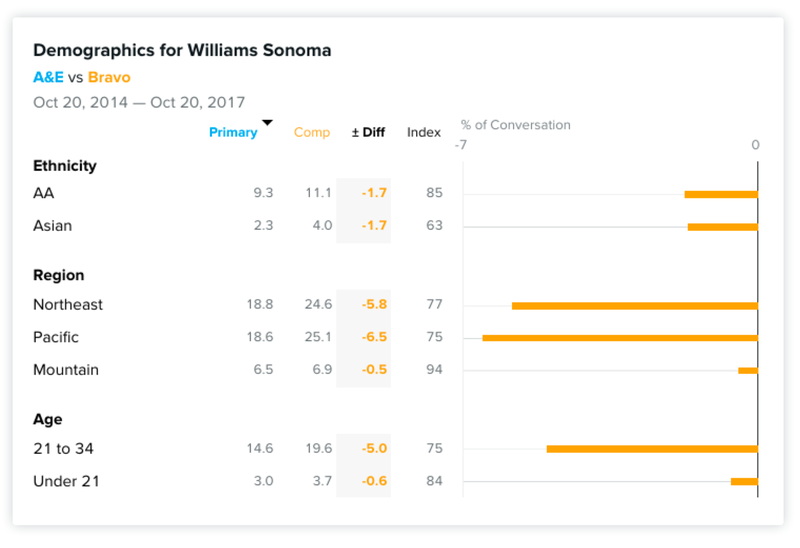 Using the SIGNUM Analysis application, the Bravo ad team can further make their case by finding which specific demographic segments of Williams Sonoma buyers skew toward Bravo and away from A&E. With these insights, Williams Sonoma can tailor their ads on Bravo shows to optimize campaigns and drive more revenue. Lastly, Bravo could go even one step further and show Williams Sonoma exactly which terms and themes make their stores and products so attractive to viewers of its shows. The data shows Williams Sonoma would be an excellent advertising partner for the Bravo Network. Its customers significantly over-index for Bravo’s audience, outpacing the general population and viewers of competitive TV networks. This is only the beginning of a possible competitive advantage for Bravo, a shining star in a galaxy of 95,000 segments Quantifind can examine. Analysis and Reach are just two of the applications that make up the comprehensive, always-on SaaS platform called SIGNUM. Quantifind designed a SIGNUM vertical solution specifically for publishers of media. To find out more contact us today.